I could not have picked a better experience to follow up study abroad. While study abroad in Paris taught me a lot about myself, European culture and traveling the world alone, backpacking through Southeast Asia taught me how travel brings people together. Southeast Asia also opened my eyes to a culture vastly different from my own, which is the opportunity I was looking for. While I found study abroad in Europe to be a very individual experience, backpacking Southeast Asia felt like a communal journey that hundreds of backpackers quietly set out on together. It didn’t take long to realize we were all loosely traveling the same circuit (aptly named the Banana Pancake trail) and would continue to cross paths along the way. It created a sort of snowball effect. We met Savannah and Rhia in Bangkok. Bart and his friend met in another city. When we all happened to be lounging on the same beach weeks later in Koh Phi Phi, one introduction led to another and we became a group of friends. Fast forward to us all (plus a few more additions) sitting around a dinner table for Thai food. Similarly, we ran into our new friend Ellen in three different cities, our friend Bearded L in two countries and were referred to meet up with new friends along the way in Laos. If you aren’t already convinced that backpacking Southeast Asia is an experience worth adding to your bucket list, you’re just going to have to trust me that you will quite possibly have the most fun of your life (or maybe look at this magical day I played with elephants… if that doesn’t get ya I don’t know what will). Here is a suggested itinerary with a few tips for putting it together based on our two-month experience backpacking Southeast Asia. Click on the links for more information and posts about my experiences in each place. Hop on an overnight train headed north to the second largest city in Thailand, Chiang Mai. Chiang Mai is still quite large but offers a bit more ease in the transition to SEA culture. The streets are a bit quieter and the air is a bit cooler when you head to the temple in the mountains. When it gets too hot, hop in a pool or find indoor dining until the night markets open. Pai was hands down my favorite place in Thailand. It was rural and transportation was limited making it all the more fun. Hop on a motorbike and head off to the waterfalls, land split and canyon or walk around town. Make sure to book this full day tour in advance, wear sunscreen and comfortable clothes and prepare to get wet in the river when you bathe the elephants. Take a jeep tour around the island so you can hit all the main attractions (on and off the road) in one day and spend the other day lounging in the sand. Or even better go diving, if you have the time and money. You travel between the islands using Lomprayah ferries that operate on a regular schedule. This island is popular for its monthly full moon parties. They now celebrate half-moons and just about every other moon you can think of so it’s always a fun time here. Prepare for a nocturnal lifestyle. Stay in Patong Beach if you are looking for nightlife or one of the neighboring beaches for a tropical oasis. Book a long tail boat tour of James Bond Island, which should include a stop at Panyee, the floating Muslim fishing village. Also visit the Monkey Temple, a temple in an exquisite cave that is home to a large family of monkeys eager to eat bananas and jump on the tourists (although please be smart and humane here). 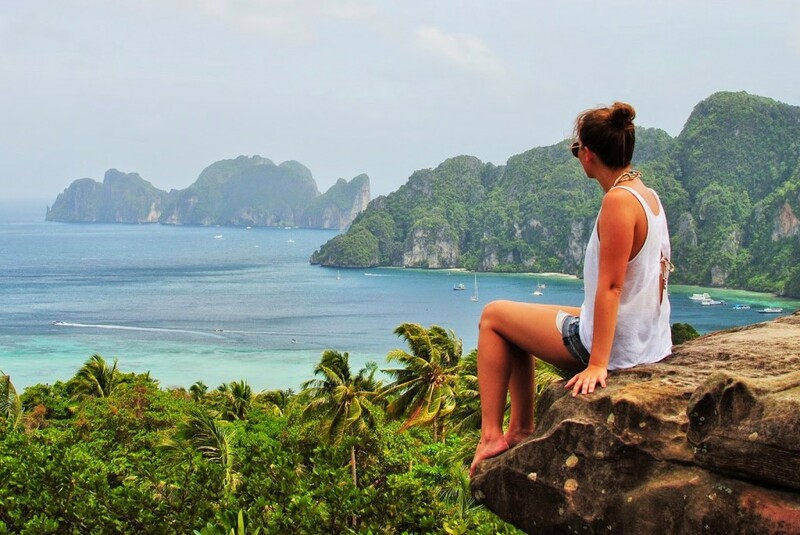 Once your settled in, walk off in search of the viewpoint for a stunning overlook of the entire island, Koh Phi Phi Don. Enjoy the beach and please, please stop for a bite to eat at Papaya while thinking of me (say hello to fridge cat). Book a Maya Bay tour which will take you to visit the infamous Beach from Leo’s movie as well as a few other islands and beaches for snorkeling. Now that you’re a seasoned vet, explore Bangkok with confidence and tell those pesky tuk tuk drivers, “no thanks, I’ll go for a metered taxi.” Khaosan road is hectic but fun and packed full to the brim with backpackers. There are other great places around the city as well. Angkor Wat is the main attraction in Siem Reap for good reason. Catch the sunset and then the sunrise the following morning for the full experience. The tomb raider temple was my favorite but try to avoid the crush of tour groups by going early in the day or late in the afternoon during off season. I wasn’t able to do this – I flew from Siem Reap to Luang Prabang to make crossing the border and the visa process as simple as possible – but if I had the time I would’ve slowly made my way through 400 islands then north through Laos. Here is a guide for getting to Don Det. You will have to take a bus through Vientiane, Laos’ capital, to get to Vang Vieng. When you arrive spend your first full day tubing the river. Do not bring anything of value that cannot get wet and prepare to party it up in this quirky twist on a pub crawl. The next day do your best to recover and either bike or motorbike to the Blue Lagoon. There are many caves you can stop to explore along the way. Also, don’t forget to catch a slow boat tour of the Buddha caves or explore the Kuangsi waterfalls. From here, I would head into Vietnam if I had more time. We returned to Bangkok for a few days after Laos before flying home. Which destinations in Southeast Asia do you recommend? If you’re planning a first-time trip to SEA I would love to be a resource so shoot me an email or ask away in the comments below! Check out this post if you are looking for hostel recommendations. Hi! I have REALLY enjoyed reading our post! My partner and I JUST decided we will travel for 2 months in Southeast Asia. We have never been and know almost nothing, but exciting after reading your blog! I would love any help!! My email is [email protected].